Adopted children want more information about their birth family and why they were adopted, according to a report. A study by children's rights director for England Dr Roger Morgan says they feel badly informed about the process. Dr Morgan is calling for them to be given more support. He surveyed 208 adopted people, aged from six to 22. In a separate study by the Commission for Social Care Inspection, one out of every two council adoption agencies failed to meet government standards. Meanwhile, the proportion of voluntary adoption agencies meeting the 31 national minimum standards is 73%. 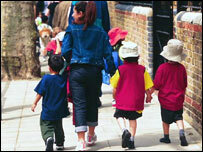 The CSCI inspected 45 council and 14 voluntary adoption agencies between April 2003 and March 2006. The commission had concerns about the quality of assessment reports on children in more than one out of every two of the agencies. Many were also failing to recruit skilled and experienced staff, according to its report. And high turnover rates and the use of employment agency workers can have a significant effect on the quality of service to the children being adopted. But the report added agencies had generally increased their support to children and their adoptive families, as well as to birth parents. CSCI chief inspector Paul Snell also welcomed a 38% rise in the number of children in care being adopted and the fact agencies "are recruiting adopters from a wider background". But he is calling for an improvement in their provision of "accurate and balanced information to children about their backgrounds". "It is vitally important adoption agencies engage effectively with birth parents," Mr Snell added. Dr Morgan said adopted children "tell us they need to find out about their birth families so they can get a fuller picture of their backgrounds". One child told him: "If you know what happened you can understand your feelings better." Another said it was important to "know their history", adding: "You can't just wipe away parts of somebody's life." Dr Morgan added: "It is really important that children are consulted before, during and after the adoption process and given all the information and help they need to be able to settle in with their new family and to make sure the right decisions have been made." Many of the children felt the process was too lengthy. One said: "It went on forever and forever." But many also said adoption had made them feel happy and settled. And almost one out of every four said they felt good about joining a new family. Jonathan Rendell, who was adopted as a baby in the 60s, told BBC Radio Five Live that he now had mixed feelings about his decision in adulthood to trace his birth parent. "I think it does start off with curiosity," he said. "I read Mr Morgan's report last night. Laudable though it is to take an interest in a difficult subject, I don't really see the point of it because it's a two-way street. "And what one comes up against - and I speak... as someone who's gone through the search - is the fact, the elemental fact, that you were surplus to the requirements and really nothing's changed. "And you really don't know this person."